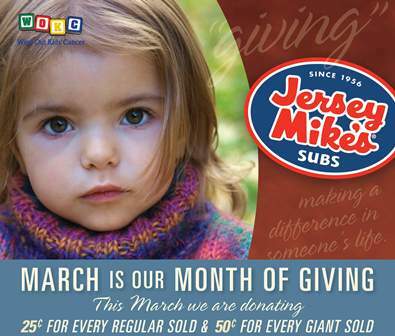 FREE Subs at Jersey Mikes on March 28th with Donation to Wipe Out Kids Cancer! Jersey Mike’s Subs restaurants throughout the DFW area will offer FREE subs on Wednesday, March 28, in a grand finale for the 3rd annual March Month of Giving fundraising campaign for Wipe Out Kids’ Cancer. The fundraising finale has been dubbed Make A Difference Day, and all 19 DFW Jersey Mike’s restaurants will give customers a FREE regular sub in exchange for a $2 donation to Wipe Out Kids, Cancer, although the hope is that people will give more. Since March 1, DFW Jersey Mike’s restaurants have contributed 25 cents for each regular sub sold and 50 cents for each giant sub sold to Wipe Out Kids’ Cancer, a local non-profit dedicated to raising money and awareness for pediatric cancer research and to providing hope and support to children battling cancer. The Month of Giving campaign has raised a total of $125,000 over the last two years for Wipe Out Kids’ Cancer which has been used to fund research trials investigating new treatment options for two types of childhood cancers, medulloblastoma and neuroblastoma and to expand the WOKC Buddy Bag program which reaches out to children admitted for cancer treatment at Children’s Medical Center Dallas and Cook Children’s Medical Center Fort Worth.